The hot summer months make us all crave a way to stay cool and if you’re thinking that installing a swimming pool might be your families future solution, here are some things to consider and a few ideas for area contractors. Are you going with in-ground or above ground? If it’s in-ground, there are actually several different construction types you’ll have to choose from. Set a budget and make a look book or a Pinterest board and decide what shape and style you’ll want, as well as how you’ll treat the rest of your yard. Are you going to hire a service which will landscape your finished pool, or is that a separate contracting service, or even perhaps something you’ll do yourself? Once you have your pool there are other expenses to think about; filter systems, chemicals for cleaning, skimmers, heaters, lights, decking and optional accessories like diving boards. Another thing to make sure you investigate in advance is your HOA or local guidelines. Many times the legality of an area will specify that you must have a privacy fence if you’re going to have a pool, for the safety of children in the neighborhood. Along these same lines, something to think about is resale. A pool can be a strong selling point to people who want a pool, but it could be a total deal killer for someone with very small children or who isn’t looking to deal with the upkeep and maintenance a pool requires. Do you service pools after installation? How many referrals can you provide? A good contractor should cover the entire scope of the project with you in writing. The contract should detail everything that is and isn’t included, materials they’ll use, the expected duration of the project and a total, fixed price. Installing a pool is a major and invasive construction project. Make sure you establish in advance who is liable for repairs to things like your driveway, existing landscape or any damage to your sewer/power lines. 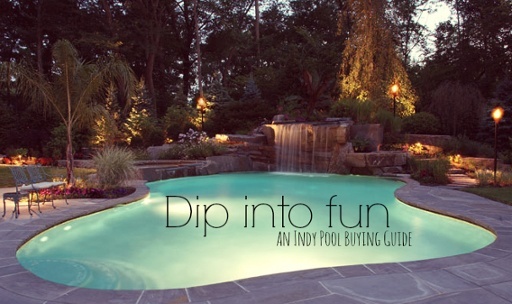 Indiana’s largest pool company, Pools of Fun has been cooling Indiana residents since 1981. They have local roots right here in Indiana as a small family business, which has grown due to maintaining good customer rapport. Even now, Pools of Fun boasts a 98.5% customer satisfaction rating. Pool City Inc. is located in Greenwood but has been providing pool services to surrounding areas such as Indianapolis for over 40 years. The company specializes in constructing in-ground pools that come in all shapes, sizes and designs so that families can have a resort-style getaway without having to leave their homes. Pool City also offers services such as leak detection, automatic covers, and pump and heater servicing. Along with many pool products and replacement parts, Pool City offers a line of grills and smokers for a complete pool side experience. They also sell hot-tubs, gas and wood fireplaces, and fire pits to give customers a true outdoor getaway in their backyards. If you’re not looking to get a pool built just simply repairing your old pool for the summer, Leslie’s Swimming Pool Supplies will have all your DIY pool repair needs. Leslie’s holds a huge range of pool products that range from chemicals, heaters, pumps, covers, and liners. You can even shop to outfit your pool with great accessories like ladders, slides, diving boards and even signs. If you don’t have a pool and are not keen on your backyard being dug up, Leslie’s has a great line of above-ground pools that can be used as a great, portable alternative to the traditional in-ground pools. While it’s true that having a swimming pool at home is a bit of a luxury, it’s an amazing investment. Especially when the summer heat is raging, you’ll be happy you had a piece of the Caribbean installed right at your backyard. If it’s a simple repair job you’re looking for to fix up the old, unused pool in your backyard, then Kendall Pool Service is your best bet. The company that was started by Matthew Kendall prides itself in providing the best customer service to its clients. With over ten years of pool experience, the company provides services such as swimming pool leak detection, vinyl pool lining replacement, as well as installation of automatic pool covers for a worry- free and clean swimming pool. The company also provides packages that can get you weekly check-ups of the water, filters and pumps to ensure that your pool is always in the top shape. If you end up getting a pool, you're diving into a fun adventure!